Joseph W.R. Stambaugh of the Seventy-fifth Illinois Infantry suffered a wound in the side during his first big fight at Perryville, Ky., on Oct. 8, 1862. He made a full recovery and joined the Pioneer Brigade of the Army of the Cumberland, with which organization he served on detached duty in Tennessee until November 1864, when he joined the First Veteran Volunteer Engineers. He mustered out of the army as a captain at the end of the war. He died in 1890. I’ve had this image in my collection for years. His story appeared in my first book, Faces of the Civil War: An Album of Union Soldiers and Their Stories. The image came to my attention the other day after trading emails with author and historian Greg Mast, who is working on a new book about North Carolina men who served during the Civil War. Although Stambaugh wore Union blue, he was born in Fayetteville, N.C., according to his military service records. Later census records state that he was born in Maryland and Pennsylvania. It is unusual in my experience to have such confusion about a soldier’s state of origin. I’ve added this carte de visite of Edward Franklin “Eddy” Ferris by unidentified photographer. 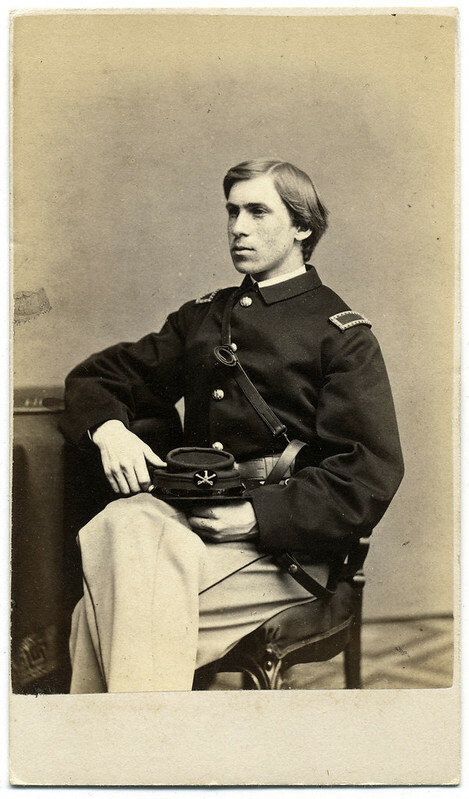 New York born Ferris started his Civil War service in the First Wisconsin Infantry, a regiment organized for a three-month term of enlistment in April 1861. Ferris returned to the army with the Fourteenth Wisconsin Infantry in January 1862. As first lieutenant of Company A, he distinguished himself for coolness and bravery at Shiloh, where he suffered a wound. Ferris returned the the regiment, and ended the war as lieutenant colonel of the Fourteenth. Ferris became a partner in a banking and agricultural hardware and implements firm of Sebree, Ferris, and White. The business followed the Utah and Northern Railroad as it was constructed. Ferris died in 1908 in Bozeman, Montana.